DESCRIPTION A well-presented mid Town House constructed to a high standard by a family run local builder, Cherry Tree Homes (UK) Limited. The property offers spacious living accommodation to briefly comprise of; Main Entrance Hall, Cloakroom, Open-Plan Lounge and Dining Area, Fitted Kitchen Area. First Floor Landing leading to Two Bedrooms and Bathroom. Second Floor Landing leading to Two Further Bedrooms and Shower Room. Outside, there is a rear garden and allocated parking space. The property further benefits from gas central heating and uPVC double glazing. GOVERNMENT HELP TO BUY SCHEME AVAILABLE ON THIS DEVELOPMENT. Cherry Willingham is a popular village to the North East of the Historic University and Cathedral City of Lincoln. There are village amenities including shops, post office, public houses, takeaways, medical centre, pharmacy, library and sports clubs. Educational establishments include the Cherry Willingham Primary School and Cherry Willingham Community School. Worship is available at St Peter and St Paul (Church of England) and the Cherry Willingham Methodist Church. There is a bus service to Lincoln which has the usual High Street Department Stores, banking and allied facilities, multiplex cinema, marina and art gallery. The famous Steep Hill leads to the Uphill area of Lincoln and Bailgate with its quaint boutiques, bistros, Cathedral, Castle and Bishop Grosseteste College. ENTRANCE HALL With uPVC main entrance door, radiator and stairs rising to First Floor. CLOAKROOM With WC, wash hand basin and radiator. OPEN-PLAN LOUNGE/DINING AREA 16′ 6" x 15′ 3" (5.049m x 4.654m) With uPVC French/patio doors to rear garden, TV point, two radiators and under-stairs storage area. KITCHEN AREA 9′ 3" x 8′ 1" (2.836m x 2.483m) Fitted with a range of quality base and wall units, drawers and solid wood worktops, cupboard housing the Alpha gas central heating boiler, integral fridge freezer and dishwasher, part-tiled surround, fitted Prima oven and hob, extractor hood, Belfast sink, part-tiled surround and uPVC window to front elevation. FIRST FLOOR LANDING With stairs rising to the Second Floor. BEDROOM 1 15′ 3" x 9′ 5" (4.660m x 2.891m) With two uPVC windows to the front elevation, radiator and TV point. 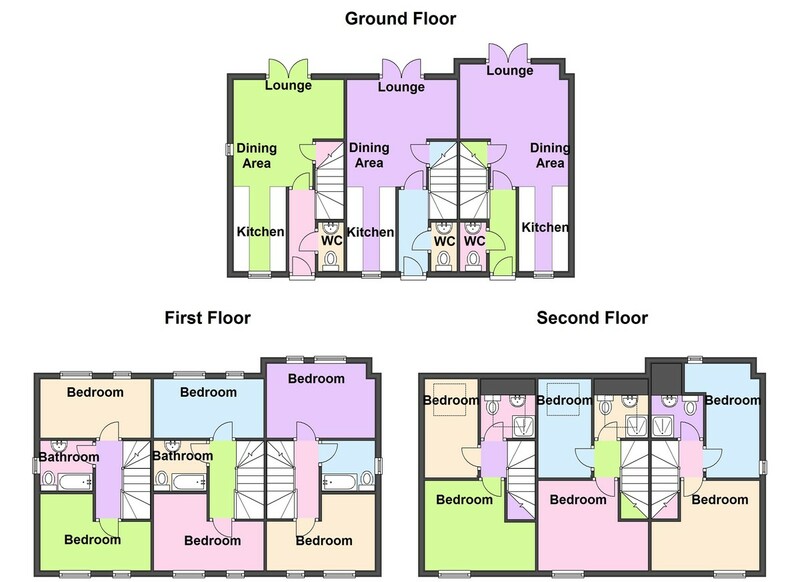 BEDROOM 2 15′ 3" x 9′ 2" (4.656m x 2.803m) With two uPVC windows to the rear elevation, radiator and TV point. BATHROOM With suite to comprise; bath, fitted shower cubicle, WC, wash hand basin, towel radiator, part-tiled surround, inset spotlights and extractor fan. SECOND FLOOR LANDING With access to roof void. BEDROOM 3 15′ 3" x 11′ 7" (Maximum measurements excluding the sloping ceiling) (4.653m x 3.541m) With uPVC window to the front elevation, radiator and TV point. BEDROOM 4 13′ 11" x 8′ 5" (Maximum measurement excluding the sloping ceiling) (4.260m x 2.590m) With keylite skylight window, TV point and radiator. SHOWER ROOM With suite to comprise; WC, wash hand basin, fitted shower cubicle, part-tiled surround, inset spotlights, extractor fan, towel radiator, shaver point and keylite skylight window. OUTSIDE There is a rear garden and allocated parking space. DISCLAIMER The internal photographs (apart from the kitchen photograph) used in the marketing of this property have been taken the show home, which represents the same style of property.